Catherine (Minerd) Rose was born on Nov. 27, 1829 in Hexebarger near Kingwood, Somerset County, PA, the daughter of John and Sarah (Ansell) Minerd. Her husband was a veteran of the Civil War, serving as a drummer with a Pennsylvania regiment. In 1846, when she was 17, Catherine wanted to marry 28-year-old local farmer Charles Rose (Jan. 16, 1819-1909), the son of Silvester and Sophia (Smith) Rose, natives of New Jersey. Charles was 10 years older, and Catherine's strong-willed father opposed the union. Recalled a friend, "the two eloped, and agreed to be man and wife. But her Father afterward forgave them, and called them home and insisted on them being legally married, which they did." The ceremony was performed at the home of Catherine's parents in Hexebarger. The Minerd clan had a close relationship with the Roses. Catherine's brother, Henry A. Miner married Charles' sister Matilda Rose; Catherine's sister Susanna Minerd married Charles' brother Andrew Jackson Rose; and Catherine's cousin Eli Younkin married Charles' sister Mary Ann. The man on the right once was thought to be Charles Rose. New evidence suggests he's on the left. More research is needed. Charles and Catherine are thought to have lived in a small dwelling on the Minerd farm at Hexebarger. They were the parents of Sarah Ann Firestone, John Wesley Rose, Susannah Elizabeth Durst, Levi Rose, Jennie Belinda Burgess, Louisa Thomas, William Rose and Jackson "Grant" Rose. By the time Charles joined the Army, at age 43, he and Catherine had five children. During the years leading up to the war, in the words of many friends, Charles was a "stout healthy man." Circa 1840, Charles is known to have labored for the father of Jacob R. McMillan of nearby New Lexington, PA. He performed odd jobs for Alexander W. Walter in 1856-1857. In 1859 and 1860, Charles and John P. Humbert "worked together at house building." He worked "during one harvest" with his wife's cousin Herman Younkin, and in a harvest with neighbor Benjamin F. Clevenger circa 1861. He also knew how to play, and in about 1861 went swimming in a creek with John Romesburg, who later said, "...we have often wrestled together and he was a good one." ...our farms were next to each other and I was intimate with him and we would see each other every day or so... We worked together for many a day at farm work -- we worked during the year before we enlisted.... [He was strong and rugged, and able to do as much as any man around these parts. After the Civil War broke out, and though the exact details are not known, Charles was hired by Alexander W. Walter of Ursina to join the Army as a substitute. The two men went to Harrisburg, PA, where on Oct. 24, 1862, Charles underwent a physical examination and was mustered into a regiment. He was said to have been paid "a big lot" of money in return. In the classic biography, Abraham Lincoln, Carl Sandburg wrote that "anyone having $300 cash, and willing to pay it as 'bounty' to a substitute, was exempt and could stay at home and laugh at the war." There was nine or ten of us ran the guard + got over the river in a boat and ran to the mountains. We stayed in the mountains a long time. When I went hom and I tried to get a pass to go back but could not get it.... I did not show myself around much. Brother in law Miner, who remained with the regiment, remembered that "The Provost was after them all hot and they hid in the mountains for a long time." Fellow soldier Younkin, who remained with the regiment, later recalled that "I heard from my home by letter that he was home..."
At that time, President Lincoln and the Union Army were desperate for able-bodied soldiers. The authoritative book The Civil War and Reconstruction by J.G. 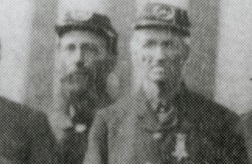 Randall and David Herbert Donald estimates that in 1863 alone, more than 85,000 officers and men had abandoned the ranks of the Army of the Potomac. To counteract this trend, the President issued a proclamation pardoning deserters. When Charles heard the news, he left home to return to the regiment. On April 18, 1863, he arrived at Newburn, NC, where he was assigned to picket duty. But within a few days, he became ill, suffering from hemorrhoids as well as a large hernia. According to one eyewitness, he "complained the second day after he returned to the Reg't and that was the reason Capt. [George C.] Schultz thought he was playing off..." The Captain consulted with the regiment's surgeon, and asked that Charles be given a thorough examination. Bird's eye view of White House Landing, a major Union supply and weapons depot near Richmond, where Charles arrived ill in the spring of 1863. Note the soldiers bathing in the river in the foreground. Charles also suffered there from typhoid fever, "which was caused by wet and exposure while on picket duty." But after a short stay in the hospital, Charles was ordered to join his regiment on an uphill march from Little Washington, NC to White House Landing, VA. Recalled fellow soldier Isaiah M. Gross, Charles "took a hard spell of vomiting and the next morning he got a bad swelling in and about the groin and the doctor pronounced it a rupture." Charles showed the swollen area to brother in law Miner, John Ansel and Henry Conn. Charles claimed the injury was a result of having fallen while trying to lift a heavy knapsack. He was sent to a field hospital on or about April 23. While he remained there, the 171st Infantry was at Little Washington, NC from April 25 to June 26, and then marched to White House Landing, VA, arriving July 1. After a stay of about a week, the regiment then marched to Harpers Ferry, VA, arriving July 9. I was unconsious and I remained so for a long time and I do not know what was done with me. When I came to myself I was in a hospital at Georgetown D.C. I never went back to the Regiment, and staid at this hospital until I was discharged.... I did not have my right mind. 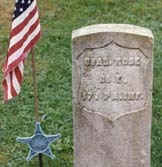 Doctors pronounced him unable to recover, and Charles received an honorable discharge at Harrisburg, PA, on Aug. 6, 1863. (A copy of his certificate is seen here, with the original found in the National Archives in Washington, DC.) He was sent home, and somehow made his way to Somerset, PA.
[He] was the most used up man that I saw from the Army. He was not able to get up one flight of steps that was at my door. He did not know anyone that talked to him. At that time he was not able to get home. He stayed at my hous to the next day when they came with a [wagon] for him. The Meyersdale Republican once wrote that Charles "returned from the war with his health shattered." After his arrival, friends came to see him, only to find him "sick in his bed," said Romesburg. "I thought he would die. I remained at his house that night and I saw his rupture, it was on his right side in his groin, where the leg joins the body. It was bulged out as big as my fist." Recalled brother in law Miner, "he looked like a skeleton.... I think he had a fever of some kind -- he did nothing for that whole year." After the war, Charles lived in Hexebarger for about a decade, with the exception of two-year period when he resided in Illinois near his sister and brother in law, Mary Ann and Eli Younkin. In January 1865, in his words: "I removed to the state of Illinois and lived near the town of Ashton in Lee Co. of that state two years..." While there, he was present when his sister died. In 1867, Charles returned to Somerset County, and purchased a small tract from his in-laws containing "a small house." The house had been used as a school by the School Directors of Upper Turkeyfoot Township from 1846 to 1867, but its precise location is not known. In 1875, the Roses moved to a large hilly farm at nearby Ursina. The property was so isolated that, Charles said, "I have not many neighbors living close to me - and I do not get to town but seldom." Among their neighbors was cousin Hattie (Younkin) Romesburg, whose son Dennis later would testify in connection with Charles' Civil War pension. The Roses were among a number of cousins who owned rights to the coal and clay below their farms. This provided a source of energy as well as income if they chose to lease or sell the rights. Wrote Charles: "I have a little coal bank and my sons worked at it and they support my family." Title to many of these tracts was in Catherine's name, perhaps to protect the property for her and her husband. Over the years, as the Rose children became adults and began families of their own, the farm was subdivided among a number of them. They included sons Grant and William and daughter Jennie, as well as nephew John Ross Miner and his wife Mary (Moody) Miner. In the deeds of transfer, Catherine retained the mineral rights and extraction privileges, perhaps as a guarantee of income in their old age. 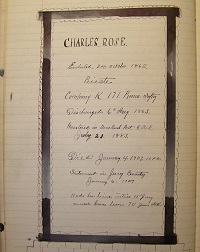 In July 1883, Charles and 22 other local veterans founded the Ross Rush Post, No. 361 of the Grand Army of the Republic (GAR). They were involved in supporting each other's claims for military pensions and advocating for veterans' rights. They also were caretakers of veterans' graves at the Jersey Baptist Church near Ursina. Friends and relatives testifying on his behalf were Alexander W. Walter, Jacob R. McMillan, Rev. Herman Younkin, George Hare, John A. Nicola, Arnold Kuhlman, Henry A. Miner, Dr. William Steele Harah, John Romesburg, John P. Humbert, Benjamin F. Clevenger (of the family of Frederick J. Younkin), Marcellus Andrews (of the family of Elizabeth [Younkin] Andrews], Dr. Winfield Scott Kuhlman (of the family of Louisa [Smith] Kuhlman) and Aaron Phillippi (of the family of Mary Ann [Younkin] Phillippi). In 1884, Charles was summoned to a physical examination in Meadville, Crawford County, PA, about 170 miles away. In response, he wrote: "I am not able to bear expenses of trip to Meadville. I cannot be there in person and don't know any one to represent me." In 1891, when examined in Somerset, he weighed only 145 lbs. He testified that there was no hereditary illness in his family. ...he nevertheless was always able to get around and his mental faculties were keen and alert until the very last. He had a retentive memory, and it was always a pleasure for those who knew him to sit and chat with him as he was always cheerful and not only could converse on all current topics intelligently, but in telling the history of the Turkeyfoot region he was a veritable encyclopedia of information and could tell a good story and enjoy hearing one with the zest of a young man. The same newspaper once said that Charles was "a thorough christian gentleman, having been a member of the Ursina Lutheran Church for a great number of years." He was elected as a supervisor of Lower Turkeyfoot Township in February 1884, as noted in the Somerset Herald. Other supervisors voted into office that year were Philip Phillippi, Joseph Wilson and Silas Cover, with cousin Balaam Younkin serving as constable. Suffering from congestion in his lungs, and the effects of old age, Charles died near Ursina on Jan. 4, 1909, just 12 days shy of his 90th birthday. He was buried at the Jersey Church, with his obituary appearing in the Turkeyfoot News. A memorial was hand-drawn in ink in the records of the Rush Post of the GAR, most likely penned by LeRoy Forquer of Ursina, secretary of the post. The contents of the building was also destroyed and nothing saved. There was about $200 in gold and currency in the house that could not be saved. The gold was found after the fire, but the $148 in paper money was burned. The building was erected by the late Charles Rose, a veteran of the Civil War, in 1872, and occuped by him and his family until his death, and had long been a landmark where the road winds over the hill to Humbert. The total loss was over $1100, with $900 insurance. Mrs. Charles Rose, who is 78 years old, suffered from the sudden exposure to the cold. Catherine recovered from the fire and in July 1917, accompanied by her daughter Susana Durst, traveled to Pittsburgh and Scottdale to visit friends. Then in October 1919, she was one of three mourners above the age of 90, noted the Republican, who attended the funeral of Dr. Winfield Scott Kuhlman, a Younkin cousin of the family of Louisa (Smith) Kuhlman. On July 27, 1922, at the age of 92, she was stricken with apoplexy and died within an hour. She was eulogized in the Republican as "highly respected and loved by a large circle of friends." Here remains were laid to rest beside her husband's in the Jersey Church cemetery. 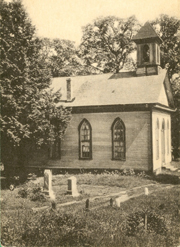 The gossip columns of the Republican observed that her daughter and son-in-law, Louisa and Samuel Thomas, and their sons Harvey and William, had traveled from their home in Fair Oaks, Lower Turkeyfoot, to attend the funeral services. The Roses are mentioned in the book, Reflections: Ursina 1787-1994 and the October 1995 issue of The Hexie Gazette, published by the late Clyde B. Miller. Charles' name is mentioned in Waterman, Watkins' 1884 History of Bedford, Somerset and Fulton Counties, Pennsylvania and on the Ursina War Memorial plaque. Copyright © 2000, 2002, 2005, 2011, 2016 Mark A. Miner. White House Landing sketch from Famous Leaders and Battle Scenes of the Civil War. Photo of Charles Rose from Draketown: Past & Present.